Heinze Cobiax Deutschland GmbH, market leader in the field of voided-slab systems for sustainable slab construction, presented their new product Cobiax CLS - Concrete Lightweight Structures - at the Munich trade fair, BAU 2019. 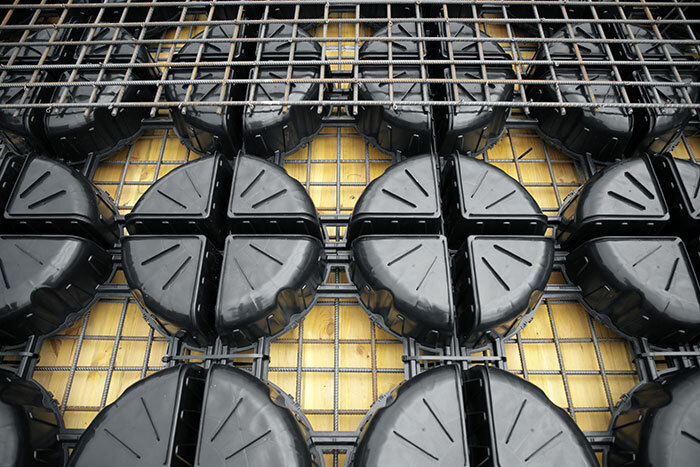 During a keynote address, Managing Directors Dr. Karsten Pfeffer and Volkmar Wanninger presented the patented structural formers for reinforced concrete slabs and outlined the new features. The CLS elements differ from previous models, Cobiax Eco-Line and Cobiax Slim-Line, in having a square footprint, 60 x 60 cm, with a quarter void at each corner. The innovative structural former half parts are available in seven different sizes from 50 mm to 290 mm tall, meaning a total of 19 different combinations of structural formers enable various slab thicknesses, from 20 cm to over 80 cm. The clever design of this latest development has huge benefits for logistics and assembly, as well as for the environment. Heinze Cobiax Deutschland GmbH received countless enquiries at the trade fair regarding this innovation in lightweight construction.